The Hunchback of Notre Dame was one of Disney’s more ambitious films of the 1990s. It not only tackled Victor Hugo’s classic and dark novel and attempted to make it a bit more family friendly, but it also explored a variety of themes such as racism, disabilities and friendship. While I would like to just review The Hunchback of Notre Dame, unfortunately this comes bundled in as a “2-Movie Collection” 3-disc Blu-ray with The Hunchback of Notre Dame II. 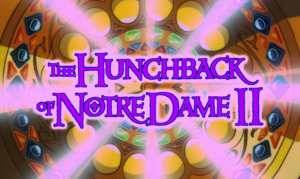 Hunchback tells the story of Quasimodo, the deformed humpbacked Notre Dame cathedral bell ringer, who has been forced by his master Judge Frollo to live his entire life up hidden up in the cathedral’s tower. Quasi dreams of going down and exploring the real world below and one day, with a little persuasion of his talking Gargoyle friends, he leaves his post and participates in the Festival of Fools where he meets the kind gypsy Esmeralda. She befriends him and they embark on an adventure throughout Paris to save Esmerelda’s people from the evil Frollo. On the surface, Hunchback did everything right by bringing back the its animation superstars: the directing team of The Beauty & the Beast Kirk Wise and Gary Trousdale, producer Don Hahn, composer Alan Menken, and all the legendary Disney Renaissance animators such as James Baxter. But still, audiences felt it was missing that “Disney” something. It was different, unexpected, and dark. And those reasons are why I generally love this movie. The problem with this movie is that seems Disney wanted it to be dark and daring, yet couldn’t fully commit. At times, the movie is dark, serious and mature, but then it switches into being goofy and comedic (see: basically any scene with the gargoyles or the song A Guy Like You), as if it didn’t trust itself. It’s like Disney wanted to straddle two boats by making a movie that appealed to adult audiences as well as children. Unfortunately, most children don’t like this movie and it is almost ignored by the Walt Disney Company. I, however, enjoyed this movie as a kid because it was different. It has great songs, cool characters and some fun scenes. The older I get, the more I appreciate it. I always thought the sequence God Help The Outcasts was a great song, but upon watching it now, I really am in awe of how great that scene really is. From even the title treatment of ‘The Hunchback of Notre Dame II’, you know it’s going to be bad. In The Hunchback of Notre Dame II, Quasimodo is still ringing those bells in the bell tower. A circus comes to town and the leaders want to steal Notre Dame’s most famous and valuable bell La Fidèle, a solid gold bell whose inside is encrusted with thousands of jewels. The circus leader, Sarousch, sends his assistance Madellaine to follow and befriend Quasimodo so that he can learn the bell’s secrets. Oh dear. 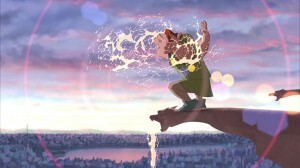 With Hunchback 2, Disney went clear to the other end of the spectrum. High quality animation was replaced with cheap, appalling animation; rich plot and story was replaced with a one-off story; and musical masterpieces and songs were swapped for unforgettable tunes. You get the picture. This movie is not good. It’s clear that Disney spent all its budget for Hunchback 2 on the voice cast because the entire voice cast from the original film has returned, in addition to two famous newcomers Jennifer Love Hewitt and Harley Joel Osment. However, everything went downhill from there because, voice cast aside, the film is horrible. Just don’t waste your time. You’ll never be able to get that hour back. Regarding the design and layout, the menus are pretty, yet simple. Basically, there are no new features in this set. Just the legacy featurettes from the Platinum Edition release known as “Classic DVD Bonus Features” (nice try, Disney, you’re still not fooling anyone). 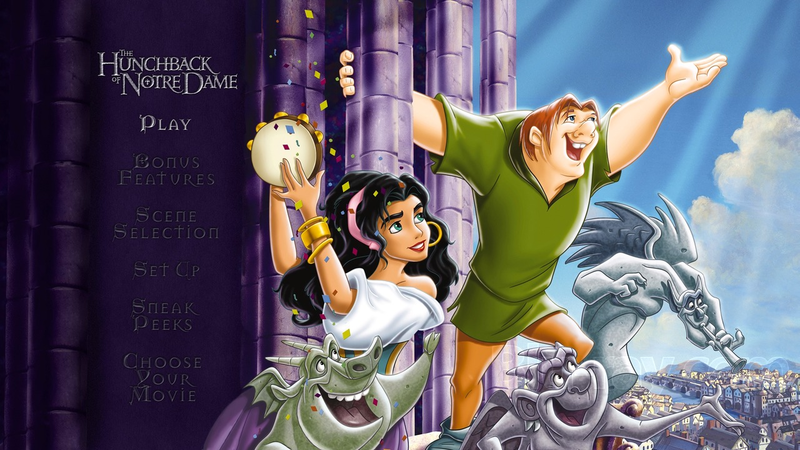 For the original Hunchback, these features include an audio commentary by the directors, a making-of featurette, a multi-language reel of the song “A Guy Like You”. For Hunchback 2, these include a behind-the-scenes with Jennifer Love Hewitt and “It’s Not Easy Being A Gargoyle”, which is basically a dramatic reading of a poem by Jason Alexander. “What is this crap?” my husband said as I was watching it. Exactly. What is this crap indeed. 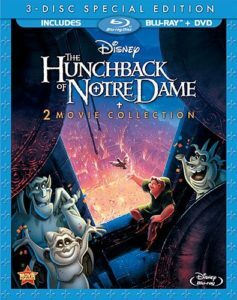 It’s really a shame that Disney is cramming The Hunchback of Notre Dame II down our throughs by including it in this “2-Movie Collection.” But the good news is that you never have to watch it or acknowledge it exists (it even has its own separate menu). 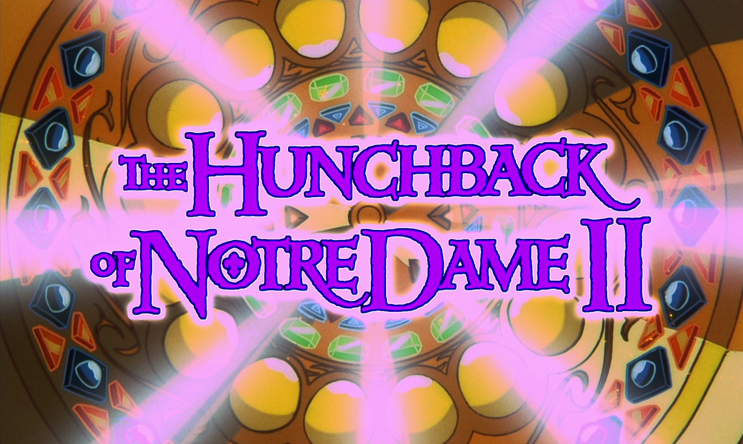 The original The Hunchback of Notre Dame, however, is very worth owning on Blu-ray. The Hunchback of Notre Dame 3-Disc Special Edition is available March 12, 2013.